Update: No longer being sold. Hot on the heels of their highly regarded 2.0 model comes an updated IWB offering from Alien Gear Holsters: the Cloak Tuck 3.0. Designed for maximum comfort and stability, this model is built for long-term wear. Our review will break down the key features by rating and then examine those features in detail. First, let's take a look at the basics. This review will cover everything there is to know about the Cloak Tuck 3.0, from its features to its faults and everything in between. Inside-the-waistband has become a popular carry position due to the inherent concealability and easy reach it provides. Generally speaking, holster manufacturers have approached IWB holster design in one of two ways: either prioritizing small size to keep them hidden or strong attachment to hold them in place. The Cloak Tuck 3.0 falls squarely into the latter camp, boasting a wide supporting band and a molded thermoplastic shell designed to keep your firearm right where you need it. The Cloak Tuck 3.0 aims to provide users with the ultimate in IWB carry. Its design centers around comfort and ease of access. The unit consists of two pieces, the holster shell itself and the waist panel to which it mounts. Constructed of molded plastic, the shell will stand up to anything the wearer can throw at it; the back plate attaches firmly to the wearer's belt with clips on either end of the assembly. In short, anyone looking to improve the comfort level of their IWB carry option should consider this holster. The neoprene back plate contacts the wearer's body across a wide surface area, reducing shifting and holding the holster and its resident firearm securely in place. The price falls somewhere between "reasonable" and "outright inexpensive," given the quality of the fit and finish. In terms of skill or familiarity necessary to use this holster, we would consider it to be novice-friendly with one caveat: Users should strongly consider anchoring the belt clip screws with Loctite or a similar productx to prevent their backing out. If that sounds like an annoyance you don't want to deal with, you may want to look elsewhere. One of the best features of the Cloak Tuck 3.0 is versatility. This holster assembly can be ordered for nearly every major manufacturer's pistols and a few niche models besides. No matter what you choose to carry, expect a smooth draw unencumbered by gimmicks or awkward angles. When it comes down to it, the draw is the reason we purchase these holsters, and this one will not let you down in that regard. The hard shell, designed to protect your pistol's finish from damage, will do just that when put to the test. Those looking to buy this holster can expect to find everything they need to start carrying included with their purchase. The package contains the holster shell for your chosen handgun mounted to the back plate, two belt clips, and a spare parts package that includes an Allen wrench for easy adjustment. The Cloak Tuck 3.0's legendary comfort comes from its wide, flexible back plate and Alien Skin material. Similar to neoprene, Alien Skin improves on classical holster materials with a textured surface that aids in retention. Those who carry concealed while riding a motorcycle or lawn equipment will appreciate the extra defense against vibration this provides - no more need to worry about your favorite pistol shaking loose and making a run for it! 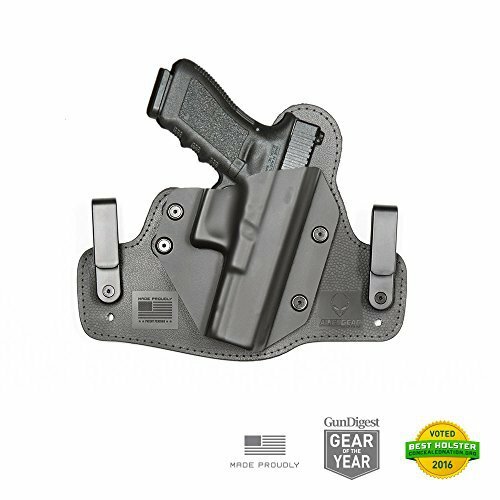 The portion of back plate directly behind the holster comes reinforced with a spring steel plate which lends strength and rigidity without sacrificing the flex the holster needs to fit the wearer comfortably. The Alien Gear Cloak Tuck line is famous for its comfort, and this iteration maintains the trend. The only potential downside for those planning to make this holster their daily go-to for concealed carry is the reported effect of wear on the belt clip screws. As mentioned, buyers should plan to apply Loctite to these screws once they find the right height setting for their holster. The Cloak Tuck 3.0 might not be the ultimate in IWB holsters, but it's close. If you're not convinced, though, other solid options abound. Those looking for the smallest holster they can find to get the job done should check out the Sticky Holsters product line for the ultimate in tiny form-factor. If you favor OWB carry, Galco is widely considered to be one of the best in the business for classic leather. If you're unsure which to pursue, check out these expert opinions from GunCarrier.com. If you can't tell by now, we're big fans of the Cloak Tuck 3.0 from Alien Gear. The flex and comfort make it easy to wear for long periods of time, even in a hot climate. The holster retains well, draws well, and keeps your weapon out of sight. If you're looking for a new IWB option that'll stay in place and not break the bank, have yourself a close encounter of the 3.0 kind.